By Dr. Lloyd Berg, PhD. In the United States, the average consumer believes that most of the world’s pineapples come from Hawaii – and even furthermore, that they are a native fruit of The Aloha State. And although long has Hawaiian tourism and state marketing encouraged the connection, this belief couldn’t be anymore false. Pineapples are believed to be native to Paraguay and the southern part of Brazil. Natives of that region spread the fruit throughout South and Central America, and all the way through the Caribbean region, including the West Indies. It was on the island of Guadeloupe in 1493 that Christopher Columbus came upon the fruit and took with him back to Europe. After more than 150 years of consumption by only the most elite, European powers began harvesting the fruit in respective colonies. 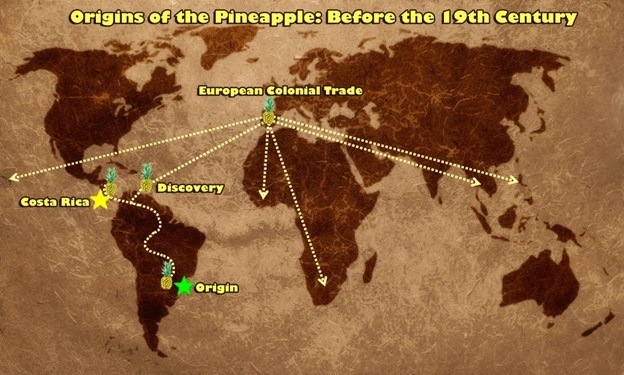 The colonial pineapple trade in the late 1600s and early 1700s solidified the pineapple as a status symbol. Even with all of this migration, it still took more than 300 years after Columbus’ discovery for the pineapple to finally make its way to Hawaii. The first appearance of the fruit wasn’t until 1813. Pineapples have been growing in Costa Rica for what is believed to be more than 400 years. Chestnut Hill Farms began growing pineapples in 2000. For more information about Chestnut Hill Farms’ Perfect Pineapple™ please contact our offices at (305) 592-6969. This entry was posted in Featured, Tips & Tall Tales. Bookmark the permalink.